The British Newspaper Archive has added the Larne Times (and Weekly Telegraph) to its database. The initial upload sees all editions published in the following years digitised and ready for searching: 1896–1899, 1902–1909; 1911–1912; 1931–1939 and 1940–1949. In due course, more editions will be added, so that the holding for this paper will eventually span from 1893 to 1955. 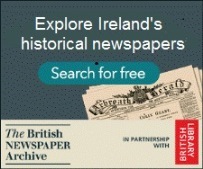 This paper will also join FindMyPast's Irish newspaper collection. It isn't appearing there yet, but will no doubt make its entrance soon.